Cancer Is A Drag is a small charity that aims to provide financial support and wellbeing to people and their families living with cancer. This comes in the form of financial aid and awareness raised at fundraising ‘Drag’ related events and campaigns, and the sale of branded merchandise such as T-Shirts. This small charity was set up by it’s Founder, Alan Bugg, who has been battling with the disease since September 2010 and has experienced first hand the need for financial, moral and emotional support whilst having to deal with a cancer diagnosis and its related treatments. The charity was originally launched in June 2012 at London/World Pride with a walking group in the parade where their supporters were dressed as Doctors & Nurses. When Cancer is a Drag got in contact with us, they asked us to produce printed doctors coats, scrubs and T-Shirts, which were all printed with their name, info and logo. 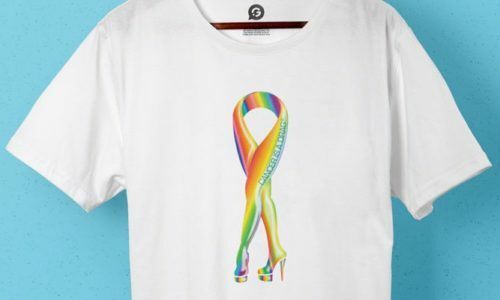 The purpose was to get their famous Rainbow Legs logo and their charity information out there and to help raise money for their excellent cause. “Since Day 1 Garment Printing have been able to offer us various discounts, a quick turn around from order to delivery and introduced us to new printing techniques to suite our requirements. If things have not gone to plan with regards to a particular design or technique Garment Printing have been only too pleased to change/redo an order and have even donated a batch for free to support the charity in its fundraising. A special mention should be made to Simon who has been extremely helpful at all times. T-shirts printed for us by Garment Printing have really helped us to get our name and our Rainbow Legs Logo to be highly recognised on the London scene. We are continually asked by people at fundraising events where they can buy a T-Shirt and will now be creating an online shop on our new website due in early 2015. This not only raises awareness but enables us to raise more funds.